Size: 2 ft. high, 4-5 ft. wide. Flowers: Brilliant chartreuse inflorescences last a long time, spring, summer; grayish-blue leaves to 1 in. Uses: Bright color accent, border, rock garden, container, in heat. Fire resistive. Soil: Prefers lighter soil; tolerates heavier if well-drained. Water: Low to medium. Tolerates drought. Pruning: Cut back flowering stems in late fall or winter. Caution: Sap is irritant on skin. 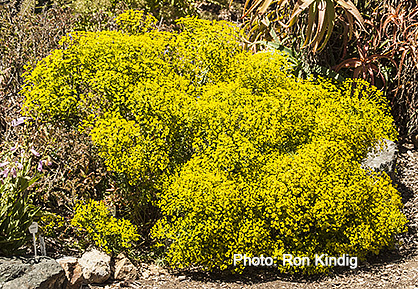 Pests & Diseases: Euphorbias are less susceptible than other succulents. May see some insects and fungal diseases. Notes: Hardy to 0° F.